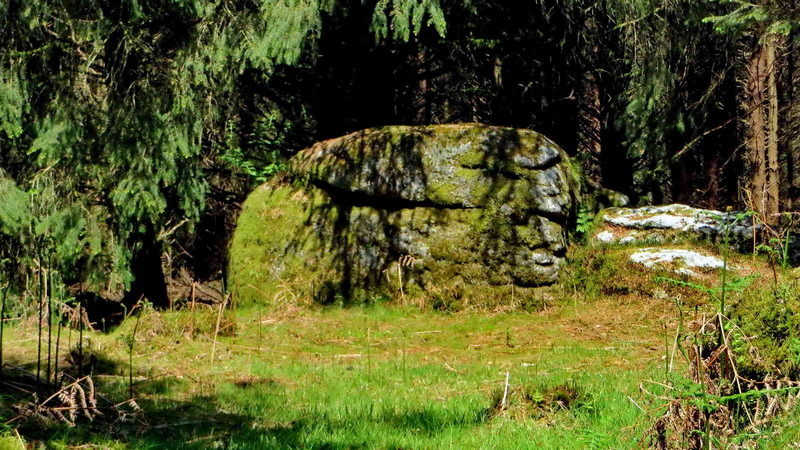 This web page introduces seven new tors and a rock to rival Cuckoo Rock, all revealed after forestry operations. They were introduced in "Dartmoor News", Issue 154, January / February 2017, pages 55-57. It is ironic that Rough Tor, after which the plantation is named, should be the smallest tor. It is also frustrating that there are still trees that hinder photography! This walk: 2016-5-24. New-found tors in Roughtor Plantation at Burrator: West Rough Tor, Lower West Rough Tor, Great Rough Tor, Lower Rough Tor, Great Great Rough Tor, Rough Tor Rock, Middle Rough Tor, Rough Tor (the original), East Rough Tor. (11) 24th May 2016 (finalising this web page). As can be seen from the "Previous walks" above, I have made several visits to this area alone, also with Liz Miall, Ron Hill, and twice with Paul Rendell (Editor of "Dartmoor News"). Paul has also made several other visits and discovered most of these tors, Ron was first to see Middle Rough Tor as we approached it, and I lay claim to first seeing Lower West Rough Tor (which caused confusion because we thought there was only one tor there) and also Great Great Rough Tor. � 11 Includes walking stick for measurement. West Rough Tor SX 57128 68762 265 869 � 11 There are two montage views below of this tor. Great Rough Tor SX 57209 68750 271 889 � 9 The image below is limited - this is a big tor. 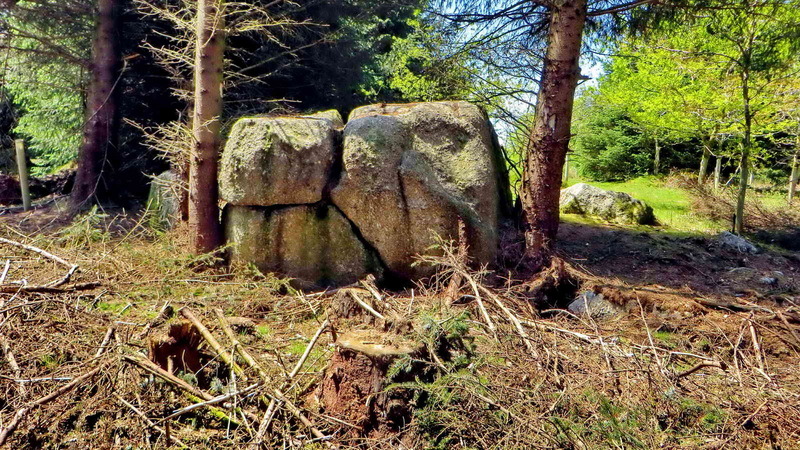 Great Great Rough Tor SX 57358 68740 260 853 � 11 The image below is limited - this is a big tor. Middle Rough Tor SX 57388 68642 300 984 � 6 The GPS location for this tor was recorded north of the tor. Rough Tor - the original SX 57435 68560 312 1023 � 4 The GPS location was recorded in the centre of the rocks on the hill top. Footnote 1: "Location" is a point to the north of each tor that puts the walker in a good viewing position of it, almost within touching distance. Footnote 2: "Elevation" is at the point where the "Location" was recorded. Footnote 3: "Error" - the GPS unit (Garmin GPSmap 62s) was calibrated in the open, before entering the wood, with an accuracy of �3 metres. The error is a +/- figure that is a "bubble" of uncertainty; it applies to both horizontal and vertical measurements. Additional footnote: the data presented here is dependent on where one stands when recording locations etc. For the most part, they were recorded a few metres to the north of each tor. The same is true for photography, there are still a lot of trees and also fallen trees and branches that conspire to obscure your view! 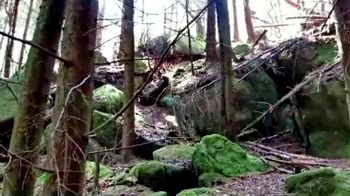 "On the highest ground within Roughtor Plantation is the rock pile from which the wood takes its name, Rough Tor (approx. 1,000 feet). This small but rugged tor regained for a while during the 1920s, its aspect as an intrinsic part of the valley scenery. Mr Watkins, formerly of Narrator Farm, told me that, shortly before he abandoned the farm in 1924, ...................... nearly all the now deserted farmsteads, most of them occupied, were visible from the tor and that its prominent position at the head of the rocky slope above the Narrator valley contributed much to the former grandeur of the scene". Lower West Rough Tor - the upright walking pole (at right) measures 5' 2" (1.88 metres). Click the image to see a larger version. Higher West Rough Tor - I - click the image to see a larger version. Higher West Rough Tor - 2, showing a wall - click the image to see a larger version. Great Rough Tor - click the image to see a larger version. Lower Rough Tor - click the image to see a larger version. Great Great Rough Tor - click the image to see a larger version. As with the images above, this is a montage but this one did not fully work, there are gaps in coverage around the edges. A panning look at Great Great Rough Tor. Click to see Great Great Rough Tor and nearby rocks circumferences on Google Satellite: these were recorded by walking around the edge of the tors, mostly within touching distance. 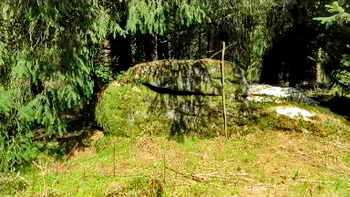 Rough Tor Rock, judging against a 6' 3" human scale, this is close to 12'6" tall. According to Hemery (page 151), Cuckoo Rock is fourteen feet tall. Middle Rough Tor, with a 5' 8" human scale. The Rough Tor rock pan. "The summit rock has a well-formed basin, sixteen inches in diameter, five inches in depth, and with a distinct lip; two smaller basins in a lower rock show by their angle that the rock has tilted". A 360� panning movie of the original Rough Tor, on the hill top. The walking pole measures 5'2" (1.88 metres). Are there more tors to be found? The east end of the area, out to and north of East Rough Tor is a bit of a rock field: where the forest merges into more open ground. There are several conspicuous rocks here. It is possible there is still a substantial tor to be found. NB - Caution is advised when exploring this area. Now that most forestry tracks have been scraped and levelled, they are much easier to walk but off the tracks there is a great deal of brash that offers a possibility of injury to ankles etc. It is useful to have at least a walking pole or, as I prefer, a long staff for balance. There are also remnants of mining operations with at least one major artefact, Rowtor Mine at SX 57397 68675 and an adit, at SX 57385 68724. There are also assorted gullies to fall into. It is dangerous to walk under hung-up trees, they can fall at any time. There are also trees loosened by other trees falling against them and others that are now sensitive to wind blow after their neighbours that once sheltered them have been removed. The trimmings come from a tree harvester: video 1, video 2, video 3 & video 4 - this last one shows day and night logging in Scotland. It is easy to see where all the brash comes from, and the deep ruts in the forest floor. MAP: Blue = planned route. This walk is reached by parking at the Burrator Arboretum car park (marked by the yellow cross on the map); this is around the "far" i.e. east end of Burrator Reservoir, where the road bends to run west. Access is simple via the "Gateway" stile, at SX 57115 68633. This can be reached by cutting through the arboretum (if you know the way! ), or with more ease by walking westwards along the road a little way and turning left up through the woods using an old lane to Narrator Farm (SX 56665 68810, in ruins). Distance - the route, in blue, is 1.00 km / 0.62 miles.